the 7L Cabin Blog: Why can you have a house there but something for the enjoyment of others can't be placed there? This is such a great question, and I'm glad this comment is giving me a reason/chance to talk more about it. When the Artificial Reef Society proposal first came up, I was actually excited about the idea of an exciting eco development in our little bay. But even after I did some research on artificial reefs, and decided there was no way I could believe that sinking a warship in that bay was going to benefit the environment, I had to ask myself, do I just care about this because I'm building a cabin there? 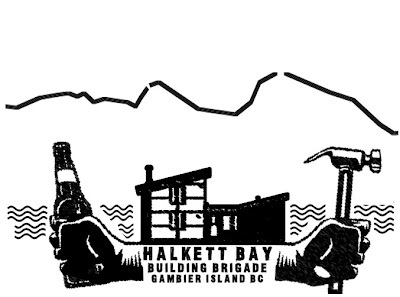 The truth is, Anonymous, I am, in every sense of the word, invested in the future of Halkett Bay. But I don't think that it's OK to dump what is essentially government surplus into our oceans, and pretend it's about ecological improvement. Not at Halkett Bay or anywhere else for that matter. And I don't think it's OK when government officials tell you something is a done deal even before the final consulting processes are complete. You shouldn't either. The more I delve into this issue, the more dismayed I am by how this process has been conducted, and how individuals and communities are having to fight against the kind of greenwashing which artificial reef societies and government agencies have used to justify dumping potentially hazardous materials into our oceans, not just in Halkett Bay but in many other locations as well. As for our cabin, there are a few things that separate it from the Annapolis. It's smaller for one, a lot smaller. It isn't right in the middle of a publicly used park. It's being built on an old clearcut site, and we're working hard to keep our footprint as small as possible. But we're not trying to pass ourselves off as a benefit to the environment either (although the mice in the solar power tower might disagree!) It isn't covered in anti-fouling paint. It might fall down, but it will never irreparably harm the marine life in this small bay. And if there was any chance of that happening, I certainly hope you would speak out against it. Anyhow, that's my own personal take on things. But you know I have an interest in preserving Halkett Bay the way it is. So I urge you to read about what some of the conservation organizations have said about artificial reefs. Read some of the things that have gone wrong. Think about how you want public land and protected marine habitats to be managed and preserved, and ask yourself if you think this project really serves those interests.